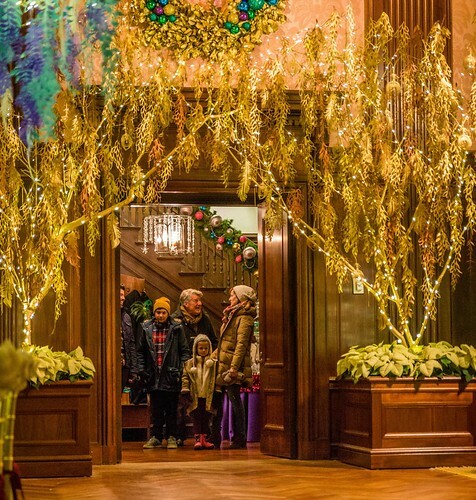 I'm taking one last look at the holidays by sharing pictures of beautiful cut paper decorations by Malinda Swain that graced Longwood Gardens in nearby Kennett Square, Pennsylvania during A Longwood Christmas 2014. Truly spectacular in person, it was difficult to capture the beauty of the colorful profusion. I've chosen several of my favorite photos from a very nice behind the scenes post on the Longwood blog and Facebook page. Thousands of likes and enthusiastic comments on each FB picture proved the popularity of the peacock-inspired masquerade ball display. 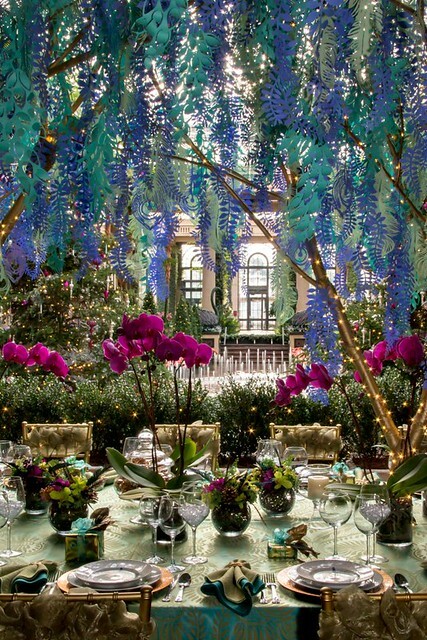 An enormous centerpiece of bare branches adorned with cut paper feathers, ferns, and vines seemed to grow right through the dinner table. X-Acto knives, scissors, rotary cutter, and an electronic blade cutter were used to create the copy paper elements. Hot glue and wire adhered them to the branches. 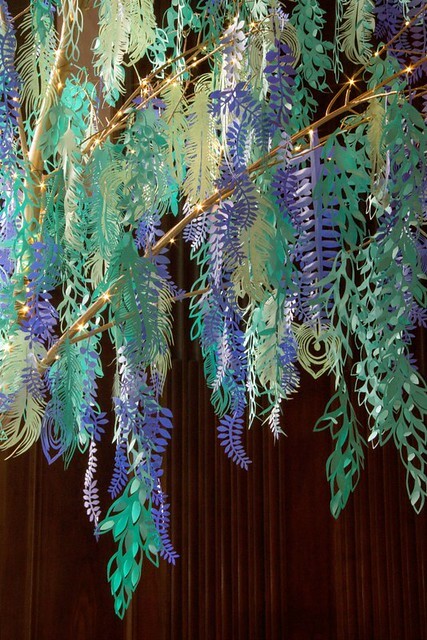 You might recall a previous post about Malinda, an artist, designer, and paper florist, that featured the huge paper flowers she made to enhance the entrance of the Philadelphia Flower Show last March. 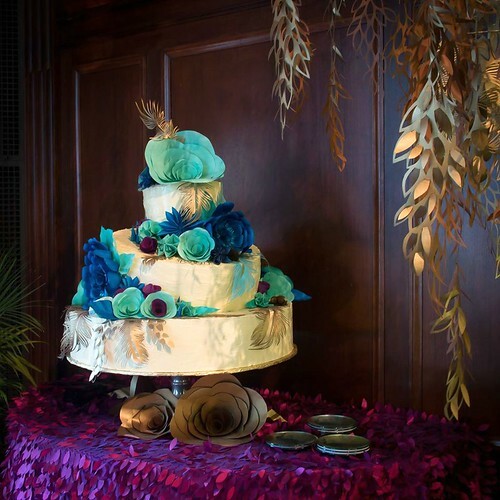 Since then Malinda has continued to create paper decorations for special events, as well as her own wedding. She was commissioned by Longwood to design the Music Room display and worked with a team of volunteers to make 2300(!) cutouts in shades of teal, lavender, and gold. 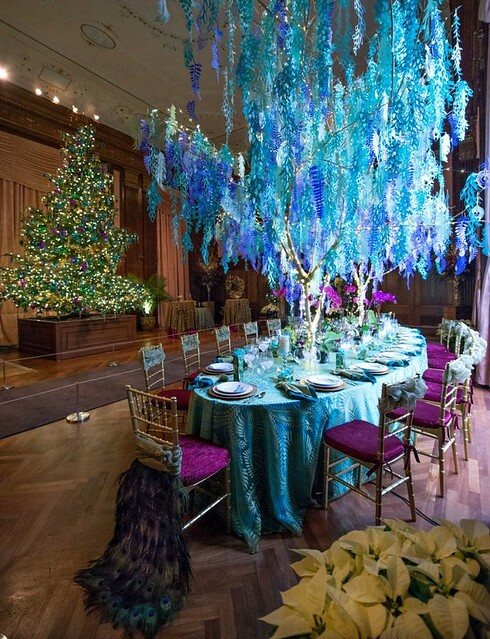 In addition to the peacock table, white lights and gold leaves hung from branches of two trees that fell on Longwood property in a snowstorm last winter, and cut paper flowers decorated a cake. Follow future projects by Malinda Swain via Facebook and Instagram. By the way, if the Longwood name sounds familiar, it is where Diana Beltran Herrera's paper birds are on permanent display. She does gorgeous work. I would love to have seen that in person. Thanks for sharing. SO pretty. Looks like a dream land. what a beaut table/ tree design!